Chocolate Gannets is located on the Great Ocean Road Apollo Bay, opposite a beautiful sandy beach & the very beginning of the Great Ocean Walk. 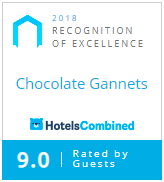 A short drive to the Otway National Park and an ideal base to visit the world renowned 12 Apostles, Chocolate Gannets offers Luxury Accommodation for families and couples looking for a Romantic getaway, with spectacular views of the southern ocean. Only 2½ hours drive south west of Melbourne along the picturesque Great Ocean Road, Chocolate Gannets allows you have a little indulgence while away from home. Each villa comprises of 2 bedrooms, fire place, separate spa room, leather lounge suites and granite kitchen benchtops, just a few of the luxuries at Chocolate Gannets. Chocolate Gannets is only 2.5km outside the Apollo Bay township, a short distance to it's restaurants and cafes or if you prefer a 30-40 minute walk along the beach into town. .....snuggling into the luxurious damask linen of lavender and avocado hues topped with aubergine mohair blankets and falling to sleep to the sound of the surf lulling your cares away.